(0 Customer Reviews) | Write Review 6 issues per year This magazine is essential reading for anyone interested in the Scottish islands, a unique part of Britain. Its in-depth articles and focused items are a great preparation for going there or a fine way of experiencing these compelling places through the most modern media. You will receive a Free Special Issue to browse and to marvel at the ways in which these islands come alive despite being formed of the most ancient of rocks. They have always attracted people owing to their landscapes, seascapes, history, language, culture, wildlife and photogenic qualities. Remote places appeal and either lure visitors directly or arouse interest through words and images. This magazine has wide appeal with full-length articles, short pieces, personal insights, topical matters & events - all illustrated with acclaimed photographs - plus book reviews and a prize crossword. The May / June 2019 edition looks at things that have lasted. The cover the Mousa Broch and on the Vision 2020 Page is a remarkable photograph of Out Stack, Britain’s most northerly piece of territory. Man’s need to create secure places is illustrated by an item on Ancient Artificial Islets and by a feature about Little Eden, overlooking islands on Loch Lomond. The endurance of Island Place-names is the subject of one article. Owls appear in the centrepiece and the wisdom of some works of fiction in Islands to Die For. The re-appearance of The Native Wooded Landscapes of the Outer Hebrides brings out wish to preserve attractive elements of life. Orkney filming; ‘The West Island Way’ on Bute; the Precious Legacy of the Campbells of Canna; getting to Finlaggan - all items regarding challenging situations are there to be read - while the Crossword is at hand to solve. This magazine is essential reading for anyone interested in the Scottish islands, a unique part of Britain. Its in-depth articles and focused items are a great preparation for going there or a fine way of experiencing these compelling places through the most modern media. Whether you anticipate seeing or just want to read about the Northern and Western Isles, the islands of Arran, Bute and Cumbrae in the Clyde, and the intriguing ‘Outliers’ which include St Kilda and Rockall, this is the magazine for you. It’s a stimulating read from cover-to-cover, with stunning images that reflect a region renowned for discovery and exploration and which merits your attention. 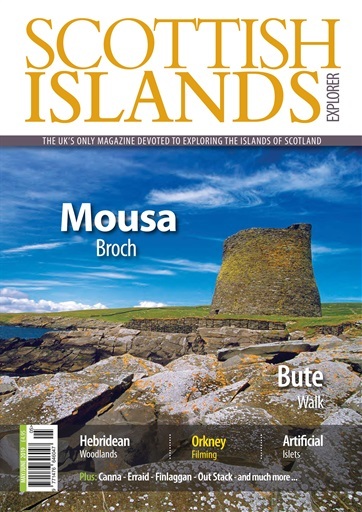 You'll receive 6 issues during a 1 year Scottish Islands Explorer magazine subscription. 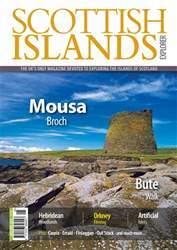 You'll receive 6 issues during a 1 year Scottish Islands Explorer magazine print subscription.